With New York State pursuing one of the nation’s most ambitious plans for generating offshore wind (OSW), the Center for Economic Growth (CEG) is working to position the Capital Region’s two water ports as facilities for the manufacturing and fabrication of OSW components. In January 2018, New York State released an Offshore Wind Master Plan for generating 2.4 gigawatts in OSW by 2030, enough to power up to 1.2 million homes. In the plan, the New York State Energy Research Development Authority (NYSERDA) assessed 54 waterfront sites along the New York Harbor and Hudson River for OSW-related projects, such as components staging, manufacturing and fabrication, and operations and maintenance. Among them, NYSERDA identified 12 as having the potential to be used or developed into facilities capable of supporting OSW projects. Two of those finalist waterfront sites were in the Capital Region: the Port of Albany-Rensselaer and Port of Coeymans. Both ports were identified as potential sites for manufacturing and fabrication facilities. More specifically, the plan envisioned the Port of Albany as housing a manufacturing facility for 8 MW offshore turbines as well as for nacelles, which are the covers for wind turbines’ generating components. The plan also envisioned a manufacturing facility for gravity-based foundations and jacket foundations at the Port of Coeymans. To support such usages, the plan found “minimal-moderate” investments would need to be made at the ports. It noted the Port of Coeymans is an “existing waterfront terminal used for large-scale construction projects” and the Port of Albany has short- and long-term leases available on its property and there is the prospect of build-to-suit capabilities on land it is looking to acquire. With the master plan highlighting the OSW manufacturing and fabrication potential at the Port of Albany and Port of Coeymans, the size and capabilities of the Capital Region’s manufacturing sector is important. Throughout the eight counties, manufacturers in industries relevant to selected offshore wind components employed more than 12,200 in 2017, up 3.7 percent from five years earlier, according to data from Economic Modeling Statistics Int. (EMSI)1. 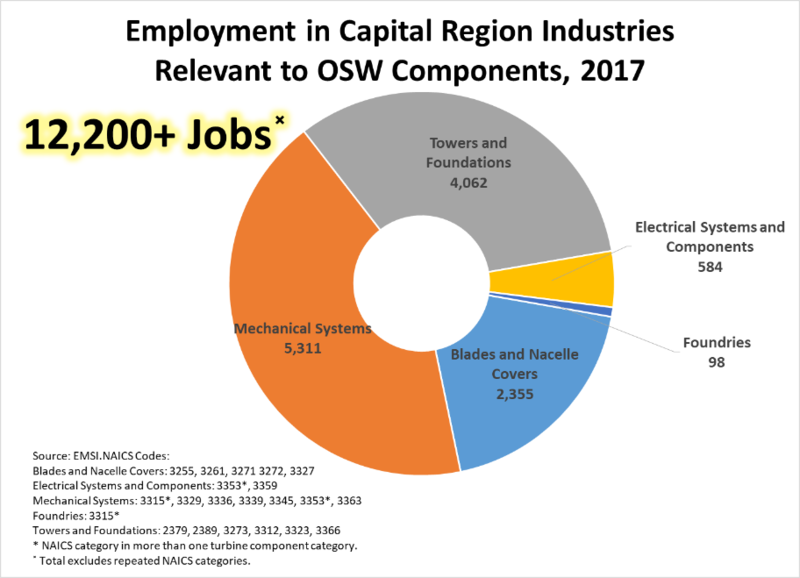 The Capital Region also offers the OSW industry robust R&D assets and talent pipelines. A Brookings Institution report found that between 2010 and 2015, the Albany-Schenectady-Troy metropolitan statistical area (MSA) generated the nation’s second greatest number of wind patents, many of which are attributable to General Electric, which has its GE Global Research headquarters in Niskayuna. In the 2017 school year, Capital Region colleges and universities awarded nearly 800 degrees and certificates in fields relevant to OSW-related occupations, according to data from the Integrated Postsecondary Education Data System (IPEDS). That total includes 336 mechanical engineering degrees and 94 welder certificates. Capital Region BOCES, Rotterdam and Albany: Trains high school students and adult learners in welding and metal fabrication. 100 percent employment rate for students in the adult program. Students receive OSHA certification, 2G and 3G AWS Tests and DOT certification. Hudson Valley Community College, Troy: School of Engineering and Industrial Technologies is part of the workforce supply chain. Modern School of Welding, Schenectady: The region’s leading generator of certified welders. Rensselaer Polytechnic Institute, Troy: The Center for Future Energy Systems (CFES) conducts R&D in, among other areas, active flow control to improve wind turbine efficiency and reliability. Clarkson University Capital Region Campus, Schenectady: Offers graduate programs in Business of Energy, Energy Systems, among others. University of Albany, Albany: The Department of Atmospheric and Environment Sciences has researchers examining wind power resource assessment and the environmental impacts of wind power. Union College, Schenectady: Robust undergraduate electrical and mechanical engineering programs – plus vertical axis wind turbines are installed on campus.